Q: Who is not a candidate for the Zoom! In-Office Whitening System? A: Patients with periodontal disease or active decay are not candidates for the whitening system. Gum tissues must be in a healthy state and existing tooth structure should be free from decay. Q: Does it really take just an hour for the entire treatment? A: The actual whitening process consists of three 20 minute sessions with the light activated whitening gel under the whitening lamp. Preparation time before the whitening process begins takes approximately 1 hour. Q: Why should I do the Zoom! System instead of home whitening? A: The Zoom! 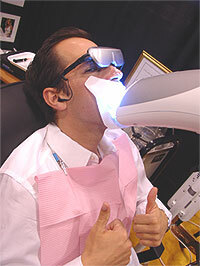 System offers the busy individual the convenience of not having to wear home trays for days in order to achieve his desired degree of whiteness. A home whitening system requires an individual to be dedicated to wearing the whitening trays daily or every other day until the desired level of whiteness is achieved. With the Zoom! System, a two-hour office visit is all it takes. Q: Will my existing restorations (crowns, bridges, veneers, and fillings) whiten to a lighter color like my teeth will with the whitening system? A: No, dental restorations including crowns, bridges, veneers, and fillings will not whiten at all. Dental restorations are made of materials that are not responsive to whitening systems. The only way to lighten existing restorations is by having them redone and a lighter shade of porcelain or composite material selected at that time.